We undertake SoftCo's Enterprise PC-DOC Optical Disk and Hard drive Cache Transfer, Conversion, Migration, Copying, Recovery, of files and scanned document images. This includes when the system was used to store proprietary files such as those used in TimeSheet and Payroll systems, as well as regular PC files such as word documents, Excel Spreadsheets, PDF etc. PCDoc is a scanner and document server system. We have an established system of site work which has met security requirements of Military, Health Care, Telecoms and Financial Institutions. We have undertaken extraction and conversions of PCDOC to TIF and PDF in UK, and abroad in Ireland (Dublin) and Denmark (Copenhagen). Our on site procedures mean no data leaves site, it is simple to implement, and minimises your organisation's internal authorisations for safeguarding data confidentiality. Release data from the PCDOC cache storage format for interoperability purposes so that it is accessible for converting and migrating to modern systems such as NAS drives and cloud storage. The work is conducted offline without the need to access the PCDoc software. We can customise database output and document naming / formats to suit your new system. We use in-house engineering for speedy modifications and customisations. We can provide Non-Disclosure Agreements or you are welcome to use your own. We can under take this work at your offices any where in the world and have an established system of on site work which has met security requirements of Military, Health Care, and Financial Institutions. Alternatively you can ship the optical disks or upload / download the hard disk drive cache ccache/cc00001.bin files and database to us. The system was mainly used during the 1990's and we have worked with many engineering, military, financial, and telecoms services to provide a copy of the PCDOC data in an easily converted file. We can copy and convert from the PC-Doc scanned files to say TIF (TIFF) PDF or other graphic formats. This makes it easy to retrieve the files on any modern PC. We can convert the metadata in the PC-Doc database to say and Excel table / CSV / Access for importing into your new document management system or simply for use as stand-alone. When the PC-Doc system was used to store regular files as opposed to scanner output, we can extract files to any hard drive (like a windows PC formatted drive) so you can open the files just like any other file. Many of our PC-Doc conversions are used on NAS or networked device to give easy access of this archive PC-Doc data by anyone in your organisation via intranet, internet or web based applications. For our friends in Danmark / København these words may help find us, PCDoc migrere konvertere konverteringer omdannelse overførsel kopi. PC-Doc was developed by Danish company Dansk Informations Teknologi A/S, DIT GRAPHICS A⁄S and was a Electronic Document Management System (EDMS) / Electronic Filing System (EFS) / Document Imaging Processing System (DIP). PC-DOC was sold through Softco. The document management software could either store scanned documents or regular files (like Word, Excel, PDF or any other computer file). The paper scanning system was designed to allow the dream of paperless office to become reality with data capture through to retrieval of documents via the web internet and network. PC-Doc usually had a scanner attached to a PC running Windows NT, together with a database for storing file metadata like document ID number, Company name, Date, Index etc. The software licence was usually controlled by a dongle. Initially the files were stored on Magneto Optical Disks (MO disks or MOD) by Sony, Panasonic, Verbatim, Plasmon and others. It used Panasonic Optical drives , Sony MO disk drives or HP Optical Disc Jukebox. Later on as hard drive capacity grew PC-Doc stored the scanned documents on the hard drive in Cache files (each file around 4GB 4000MB in size) The 2 most common variants are PCDocSe and PCDOCSG. PC-Doc stored the scanned files or computer files on Optical disks or Magneto Optical Disks (MO disk). Typically the system used Plasmon or Panasonic optical disks, or Magneto-Optical MO disks by Sony, Verbatim, HP Hewlett Packard. We can retrieve and copy the data from the PC-Doc optical discs and save them to and format that is more easily accessible on modern PCs. The optical disks are then converted to CD, DVD, Hard Drive or emailed / upload/downloaded to back you. We can convert disks in Optical Disk Library Auto-Changer Jukebox or stand alone drive NT workstation. PC-Doc database convert to csv, excel or access. The PC Doc Enterprise system has its own database and it appears to us to be proprietary system and no documentation available on its structure. Therefore we wrote our own program to retrieve your data for interoperability purposes with your new systems. We can convert the PC-DOC database to Microsoft Excel, MS Access, or CSV for exporting / importing into another database. The PC-DOC database files extensions are typically .DB, .DBS, .FDD, .KDD, .PRE. The database stores the metadata for the files that are scanned or saved to the PC Doc system. Sometimes the system is set up to use an external database like My Sql or MS SQL in which case you can probably produce us a text listing so we can name the files in a meaningful manner. - Our potential customer is looking for a solution to replace their current PCDOC DMS with Documentum. - Extract data from SoftCo 7 database application with many document types and extraction to occur onsite. - PCDOC to Laserfiche, IBM’s CMOD, or simple NAS File Server for archive access. - Move PC-DOC to Laserfiche. - We want to upgrade from SoftCo PCDOC R7 to the cloud but have control of our own documents back. - We need to perform migration from PCDOCs (DOCSOpen OpenText) to Documentum 5.2.5. - Are you (Apex Techncologies? Technologies?) able to extract the metadata and documents? - The database appears to be a proprietary BTrieve system. - Data extraction from a SoftCo/PCDOC system. - PCDoc convert to PDF. - PCDoc transfer to TIF. - Require a software tool that can help me with SOFTCO PCDOC migration. - Data recovering from 9.1GB Magneto Optical Disks which is not stored as a normal partition. - Convert Magneto Disk storage Format so we can store them on a network share. - Soft-Co PCDOC Enterprise EDMS system transfer from Magneto\optical double sided disks. - I have data stored on the PC Doc Optical Discs and I have WinNT reader. - I cannot print from the reader and I have no back up of these disks. - We no longer have any hardware capable of reading the discs. - I need to convert data from archiving system of Softco pcdoc. - I could not get the DB type for file conversions. It may not be a standard DataBase. - We need to read files from Softco PC-DOC document imaging solution. PCDoc by SoftCo problems that we recover data from are listed below. 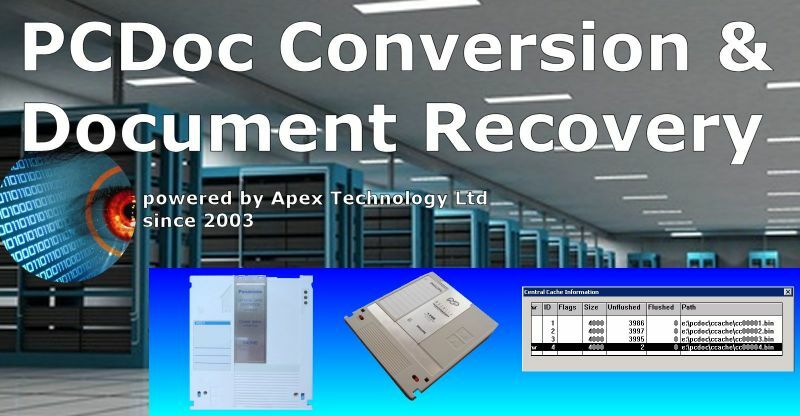 Conversion of SoftCo's PCDoc Enterprise documents and Database from MO disks and Central Cache (ccache .bin) files stored on hard disk drive export TIF TIFF PDF.